The five-day Ruta del Sol this week across the parched mountains of southern Spain will provide the first glimpse of what should be one of the most interesting storylines of 2015: Contador vs. Froome. Alberto Contador (Tinkoff-Saxo) and Chris Froome (Sky) pick up their growing rivalry they left off at last year’s Vuelta a España, when the Spaniard knocked back the African in a thrilling GC battle. Same country, different race, same ambitions. Both make their respective season debuts at the Ruta del Sol (otherwise known as the Vuelta a Andalucía, set for February 18-22), and unlike last year’s clash at the Vuelta, both are healthy and eager to race. Froome is coming off an intense three-week training camp in South Africa, while Contador has been hitting it hard on the Canary Islands. Both are downplaying their GC hopes for what will be the first of an expected season-long duel that will carry all the way to the Tour de France. Yet despite toning down their ambitions, both Contador and Froome always race to win. It will be interesting to see how each of them tackles this first GC race of the season. Over the past few years, both Contador and Froome have been “in it to win it” in nearly every race they’ve started, especially in the first half of the season. In 2013, Froome nearly swept his calendar, winning every stage race from his debut at the Tour of Oman through the Tour de France (with the lone exception of a second at Tirreno-Adriatico behind Astana’s Vincenzo Nibali). Last year, it was Contador’s turn, who was either first or a very close second in every stage race he started in his run-up to the Tour. That’s in sharp contrast to Nibali’s approach to the 2014 season. Nibble was so quiet throughout the first half of the year that many had written off his chances before the Tour started. Nibali, of course, stood tall when others faltered, including both Contador and Froome, who crashed out, and emphatically won the yellow jersey. The big wrinkle this season, at least for Contador, is that he’s aiming to become the first rider since Marco Pantani in 1998 to win the Giro and Tour in the same season. As Contador suggested, he will be entering the 2015 season quite a bit differently than last year, when he had everything to prove following his humiliation at the hands of Froome at the 2013 Tour. The Ruta del Sol, which boasts an interesting course with a short time trial and plenty of early-season climbs, won’t see Nibali or Nairo Quintana (Movistar); Quintana was scheduled to start but pulled out after crashing at the Colombian national championship. The race, however, will see the Froome-Contador rivalry click back into gear after lying dormant all winter. There’s growing respect and competitiveness between the two GC stars. In an earlier interview, Contador called Froome his most challenging rival he’s ever faced. When speaking with journalists at a team camp before heading to South Africa, Froome returned the compliment. The 2015 season could be a turning point for both. Contador is bent on winning another Tour as, by his own admission, his career is winding down. To understand the 2015 season for Contador, it’s important to realize he’s fighting to secure his place in the history of the sport. If he can pull off the Giro-Tour double — a feat only matched by seven riders in cycling history — he would definitely erase the blot that came with his 2010 clenbuterol case. 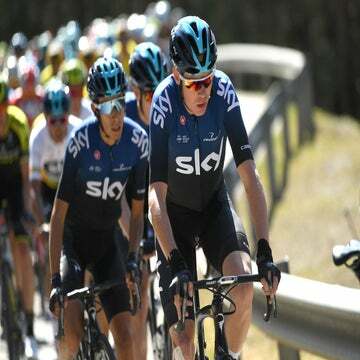 Froome is just as desperate to win another yellow jersey, not only to confirm his credentials as a Tour rider, but also to permanently cast aside the nagging shadow of Bradley Wiggins. And it all starts at the Ruta del Sol, one of the soul survivors of the Spanish peloton wracked by economic crisis that’s seen scores of races fold over the past decade. The presence of Contador and Froome serves also as a confirmation of the race on the international calendar. Competing against such well-funded events in the oil-rich Middle East, the Ruta has doggedly stuck it out. The race will be televised live internationally, but unlike races such as the Tour and Giro d’Italia, which earn millions by selling TV rights, the Ruta organization not only receives zero income from broadcast rights, but must pay for the production costs and offer the race for free to media outlets. As far as the race is concerned, it’s money well spent. Not only does it assure the primary sponsors and regional government that TV images are viewed internationally by an estimated 130 nations, it’s helped the race draw such big stars as Contador and Froome. Other names are penciled in to start, including Bauke Mollema and Frank Schleck (Trek Factory Racing), Jurgen van den Broeck (Lotto-Soudal), and Tour runner-up Jean Christophe Péraud (Ag2r La Mondiale). Commercial interests aside, the five-day, six-stage race will provide a challenging, early season test for the peloton. The race organization tries to include all of Andalucia’s provinces, perhaps an overreach for just five days of racing set against a landscape that’s larger than Belgium. The race opens Wednesday with a split stage. An opening prologue could set up some important time differences, especially between Contador and Froome. That afternoon, everyone saddles back up again for a sprinter’s stage. Thursday and Friday feature challenging terrain, especially for the major teams to control a breakaway, but the big fight will come Saturday with a climb up the Cat. 1 Alto de Hazallanas, the first real serious climb of the European racing season. Sunday’s no walk in the park, either. As Froome mentioned, the memories of the 2014 season are still fresh in his mind. And while he admits he relishes a rematch with Contador this season, he’s careful not to overlook the rest of the pack. It might not be all about Contador and Froome in 2015, but it’s obvious that both of them have an eye on each other. That could open up some room for their rivals to deliver a surprise, but the stakes certainly couldn’t be higher coming into what’s sure to be a thrilling racing season. It all starts in the Ruta.